David introduces this Psalm by describing it as a "Michtam," an ambiguous term that lends itself to a number of different interpretations. Rashi suggests that this word refers to an item that a person carries with him at all times. Thus, David here describes this Psalm as containing ideas that he would carry with him at every stage and setting throughout the life, concepts that he deemed vital as part of his day-to-day spiritual awareness. 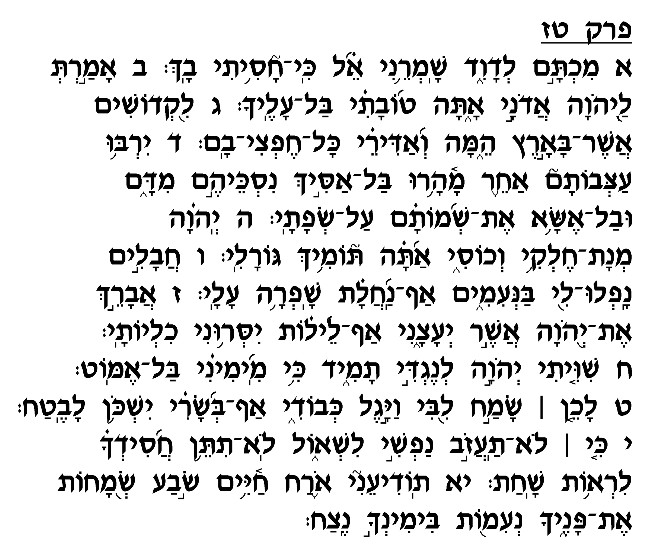 David distinguishes here between the "Kedoshim Asher Ba'aretz" ("the sacred ones in the land"), who are deserving of God's favor and blessings (verse 3 – see Ibn Ezra), and those who worship other gods (verse 4). He very firmly declares his allegiance to the first group, avowing that his "portion" and "allotment" (verses 5-6), the path that he has chosen, is that of loyalty to, and faith in, the Almighty. Thereafter David gives thanks to God for granting him the wisdom to make this selection and describes how he constantly reinforces his conviction and feels joyous at having chosen to follow and trust in God (verses 7-11). We find in this context the famous verse, "Shiviti Hashem Le'negdi Tamid" ("I have placed God before me always" – verse 8), in which David declares his unwavering commitment to follow God at all times and in all situations. In the Psalm's final verses, David describes the confidence, security and jubilation he feels under God's protection. If, as Rashi suggests, David made a point of reciting this Psalm regularly throughout his life, this is likely due to the theme of reinforcing one's religious convictions, which this chapter so eloquently and powerfully addresses. David understood that the challenges of religious life can at times lead one to question the decision to embrace the Torah over other, less demanding belief systems and lifestyles. This Psalm was intended as a constant reminder of the benefits yielded by devotion and loyalty to God, and provides the daily reinforcement and encouragement we all need in maintaining and further cultivating our faith and commitment.